For centuries, Russians have greeted spring by baking special treats. Even the simplest ingredients suffice to mark the advent of spring when baking these sweet cookies. Tetyorki is a type of traditional Russian cookie that comes from the northwestern part of the country, and they’re distinguished by an original, fanciful form. This recipe dates back centuries, to pre-Christian times, when tetyorki were not only pastry, but also a type of ritual food, meant to celebrate spring’s arrival. The name of these sweet cookies literally means “heath hens.” In some regions the same cookies are called vitushki ("витушки"), which derives from zavitushki (“завитушки”), or “twirls.” This name gives a more precise description of the cookies’ shape. A reason for naming pastry after birds is uncertain, however. According to the most poetic version, the origin of the name tetyorki is connected with spring as the time of birds’ love songs. While this explanation might seem weak, it’s worth mentioning that many other ritual cookies baked in different regions of Russia also carry birds’ names – for instance, zhavoronki ("жаворонки") – larks; snegirki ("снегирьки") – little bullfinches; and petushki ("петушки") – cockerels. 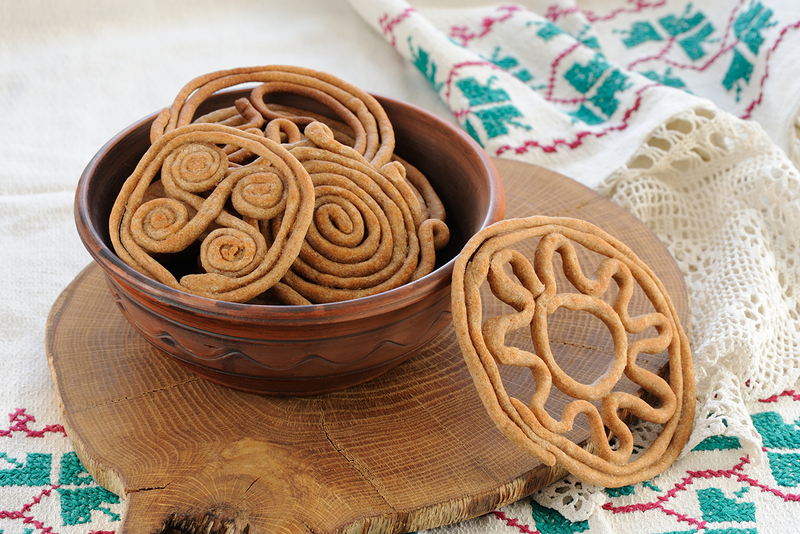 The ingredients for preparing tetyorki are very simple – in olden times any family could afford to mark the arrival of spring with these cookies, even when winter stores were coming to end. Despite this simplicity, tetyorki provide any cook with true artistic freedom, allowing an opportunity to create many different images out of dough. These were predominantly solar symbols, containing the figures of curls, crosses, flowers, and of course birds. If you’d like to try your hand in ethnic cuisine, tetyorki are a good chance to enjoy creative culinary work, impressing your friends and family with an original and tasty pastry, and marking the spring season as the people of the Russian North have done for centuries. 1. Sieve the flour into a bowl, add salt and papaver. Make a hole on the top of the flour. Pour oil, honey and some water into the hole. 2. Start kneading the dough, and pour water by degrees. When you get a solid batch of dough, cover it with a cloth to prevent from drying, and wait 10 minutes. 3. Cover the baking pan with cookery parchment paper. Now it’s time to form the cookies, laying them out onto the paper. Roll up the dough, making straps (about 5 mm in diameter), and form images of birds, twirls and suns. Feel free to indulge your fantasy. Note: If you decide to make your cookies with a complex shape, form them on a wooden cutting board, and freeze for 10 minutes before placing on a pan – that will help to retain their shape. 4. Oil the cookies and bake them at 180° C (i.e. 356° F) for 20 minutes. Next, turn them over and bake for 5 minutes more. After cooling them, tetyorki can be served.